The 19th Street Band was formed when guitarist/singer Caolaidhe Davis moved to America from Holywood,Northern Ireland in 2005 to pursue his musical career. When he found himself in need of a fiddle player, he met his future wife Meghan,who is classically trained.They began to write and perform original material, and form the nucleus of the band. The other permanent members are drummer Patty Dougherty and bass player Brian White;with two tracks augmented by banjo. All the material is self-penned,and the 6 tracks on this CD showcase their tal­ents enough to leave you wanting to hear more – it’s a pleasing, well­ crafted debut with a lot of energy in the songs,which would probably best be described as country folk-rock. The opener,jump In The Water, features close harmony vocals from Caolaidhe and Meghan and has a nice lively feel (a hallmark of their sound),as well as very melodic fid­dle playing from Meghan. Long Runs The Fox features some rootsy slide guitar and has more of an acoustic blues feel with Meghan taking the lead vocal. It’s True What They Say is a rocking minor tune with an at­tractive extended fiddle break. The remaining tracks continue along the same lines, until the closing track The Things That Matter which, is slightly more reflective, and builds nicely to finish off a very pleasant album. 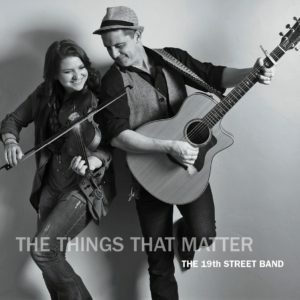 With a total running time of around 18 minutes,it leaves you wanting to hear a lot more from the 19th Street Band.